FREE EVENT at Young's Dairy - Over 7,000 eggs are ready to be picked at our Annual Easter Egg Hunt. Show up early – this is a popular event! As is our tradition, we will hard boil and dye over 7,000 eggs for our Easter Egg Hunt. This event starts promptly at 2 PM for children ages 4 and under. At 2:20 PM we do it again for ages 5 to 7. At 2:40 PM we have the final hunt for ages 8 to 10. Arrive 10-15 minutes before your age category, so you have time to find the line and get ready to go! Barnabe, our mascot, will be present, so bring your cameras! The Easter Egg Hunt is held rain (or snow!) or shine! Please check for updates on our website. 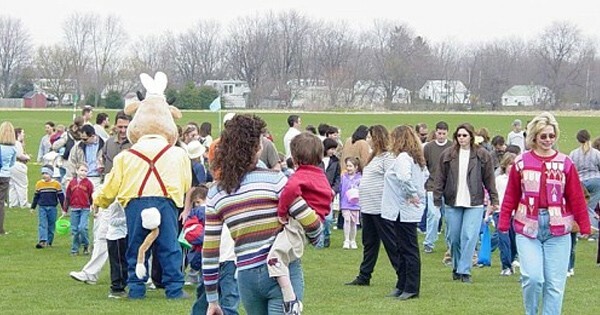 Find more events like "Easter Egg Hunt Youngs Dairy"